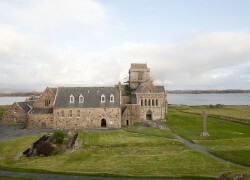 Iona’s most iconic landmark is undoubtedly Iona Abbey; one of the oldest and most important religious centres in Western Europe. Visitors come from all over the world on spiritual and religious pilgrimages to bathe in Iona’s spiritual atmosphere. Built on the site of St Columba’s monastery, Iona Abbey was built by Viking Raghnall in 1200 AD as a centre for Benedictine worship. It fell into decline and ruin during the Reformation but was restored by Reverend George MacLeod and the newly formed Iona Community in 1938. Many Scottish and European kings and chiefs are buried in the Abbey’s graveyard as is John Smith, late Leader of the Labour Party. Visitors are welcomed all year round and can participate in daily worship led by the Iona Community. The Nunnery is the first reminder of Iona’s long ecclesiastical history that the modern visitor to the island will encounter. Only a small community of nuns would have lived here, and the ruins are important in that they show so well how such a foundation was designed. The church is on the north side of a quadrangle, the centre of which served as a cloister. Opposite the church are the remains of the Refectory, while those of the Chapter House are on the east side. The buildings have been ruinous for nearly three hundred years though enough survives to make the Nunnery both romantic and interesting. The peace that the nuns must have enjoyed can still be appreciated in the lovely gardens of the cloister. 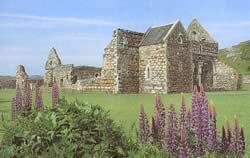 The Nunnery Museum is situated in St Ronan’s Chapel, just to the north of the ruined church. The Chapel has been re-roofed to house many of the interesting carved stones that were formerly scattered about the surrounding area. It was once the Parish Church of Iona and dates from about the same time as the Nunnery. The first of the famous High Crosses of Iona stands opposite the Parish Church and Manse. This is MacLean’s Cross, which on its weathered western face has a portrayal of Christ Crucified. Its less weather-beaten east side is covered with an intricate Celtic design. It was commissioned by a member of the Clan MacLean in the latter part of the fifteenth century. The Church and Manse date from 1828 when they were built to one of Telford’s ‘parliamentary’ designs. The architect, more famous for his roads and bridges than his churches, was commissioned by the government to provide several standard plans from which forty two new churches would be built in the Highlands and Islands. Beyond the hotel is the Reilig Oran (the graveyard of Oran) the sacred burial place of the early Kings of Scotland, Ireland, and Norway. St. Oran, from which it takes its name was one of Columba’s followers who accompanied him to Iona. A macabre legend tells how, when first landing on the island, Oran suggested that he should be buried alive as a living sacrifice to the island which would thus be sanctified. Columba accepted this idea and so Oran was buried. After three days the grave was opened up and Columba and his monks were horrified to find Oran still alive. As he spoke the words, ‘There is no such great wonder in death, nor is hell what it has been described’, Columba hastily ordered, ‘Earth, earth on Oran’s eyes, lest he further blab’, and so the unfortunate Oran was re-entombed.